G Force relishes the step up to 6 furlongs as he lands the Sprint Cup. A great win for Danny Tudhope and David O'Meara. 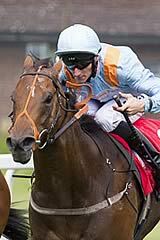 G Force lived up to his name as he powered home to give trainer David O'Meara and jockey Danny Tudhope their first domestic Group One success in the Betfred Sprint Cup at Haydock. The three-year-old had always been highly thought of by connections but had not been blessed with luck when stepped up in grade, most notably when a close sixth to Sole Power in the Nunthorpe at York last month. However, everything fell into place in this six-furlong showpiece as G Force (11-1) denied Gordon Lord Byron a place in history. Tom Hogan's stable star was trying to become the only other horse after Be Friendly in 1966 and '67 to win the race twice and he looked likely to do just that heading into the final furlong. However, Tudhope produced G Force to lead in the dying strides, eventually prevailing by three-quarters of a length. Music Master was third, with favourite Sole Power fourth after having to weave his way through as he tried to show he stays six furlongs and prove an able substitute for his stablemate Slade Power, the Diamond Jubilee and July Cup victor. Hot Streak set out to make all and was tracked by Gordon Lord Byron, while Richard Hughes settled in behind on Sole Power. The leader eventually gave way, with Gordon Lord Byron assuming control as Wayne Lordan kicked on with over a furlong to run. Tudhope steered G Force to the middle of the track and switching back up in distance after tackling the Nunthorpe over the minimum trip, O'Meara's runner found plenty for pressure to win in style. Hughes, meanwhile, was trapped in behind horses, being last at halfway, and only got daylight inside the distance, with Sole Power unable to use his potent pace to full advantage. O'Meara said of the Middleham Park Racing-owned winner: "I'm a little bit overwhelmed. I'm delighted for everyone who has put so much time into this. It's just great. We thought he was good from day one. He hasn't had the rub of the green a couple of times this year. He didn't have much luck in running in the Nunthorpe, but we had every faith he'd be able to go and do it one day. We're delighted he's managed to do it today. "I'll have to speak to the guys and see what they want to do. There's the Abbaye, but it looks like he's better over six than five." Tudhope said: "It all went according to plan. I can't believe it. I had every faith in this horse and he's shown some class to do that as a three-year-old. He's only small, but he has a massive heart and a great turn of foot. "We were a bit unlucky (in the Nunthorpe), I think we would have been placed that day. He's a class horse and thankfully he got the gaps today. It's great for everyone." Hogan said of Gordon Lord Byron: "There's only one ground he can't handle and that's dead ground and that's what he met today. He ran a super race. We're very happy with him. Hopefully we can go on. 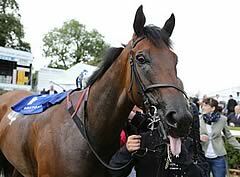 The horse ran a great race and he will go to the Prix de la Foret now and we will be back here next year." Music Master's trainer Henry Candy said: "We could have done without that drop of rain. I don't want to disappoint him on ground like that as he is a fast-ground horse. He'll make a lovely horse next year." Eddie Lynam, trainer of Sole Power, said: "Richard just came in and blamed the ground. He's run a good race and given 110 per cent and we are very pleased with him. He ran a very nice race considering he didn't like the ground. "His next run will be in France and then on to Hong Kong and Dubai. I think they will go faster (abroad) and the ground is quicker. I think there's a good one in him over six furlongs."